Our semester system offers two main starting points, September and the end of January or beginning of February. This facilitates completing as many as five credits in each semester, although four credits are standard for most students. The system also offers additional starting points in November and April for some half-credit courses. Final exams are held at the end of each of the two semesters. Each semester consists of two terms. One-credit courses are scheduled every day for a complete semester. Most half-credit courses are scheduled every day for one term. 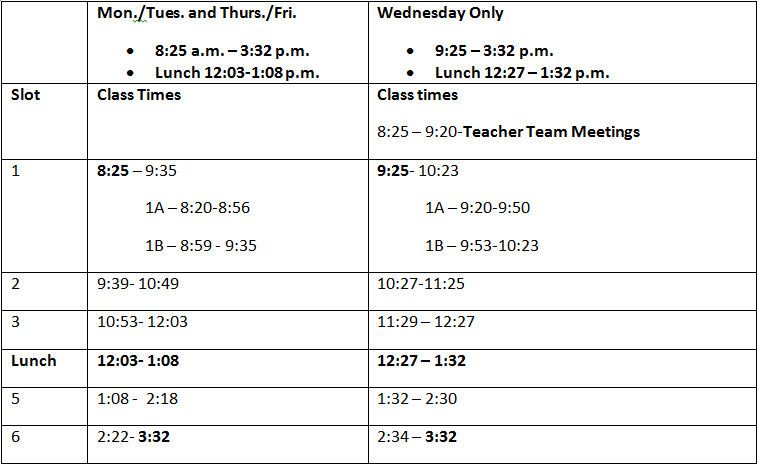 Every Wednesday, the daily schedule is adjusted to provide for collaborative planning and meeting time for teachers. The daily schedules are shown in the table below. •Slots 1A and 1B are used for some .5 credit courses or can be used for 1 credit courses. In the lunch period or after school.